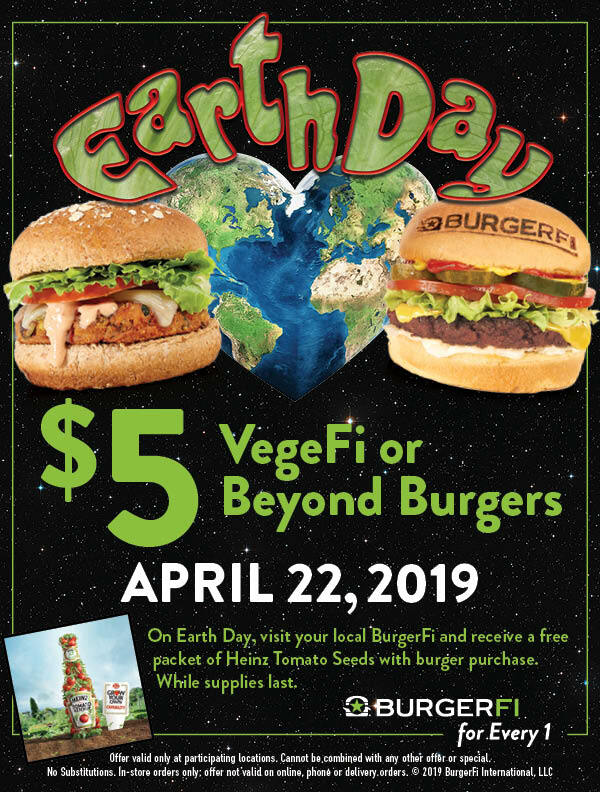 Get a VegiFi or Beyond Burger for $5 all day on April 22. To get the deal ask your server for the Earth Day special or display the BurgerFi announcement on Facebook. The Vegefi Burger is made with Crispy Quinoa + Fresh-Cut Veggie Burger, White Cheddar, Lettuce, Tomato, BurgerFi Sauce on a Multigrain Bun or green style. The Beyond Burger is made with 100% Plant-Based Beyond Burger from Beyond Meat plus American Cheese, Ketchup, Mustard, Mayonnaise, Lettuce, Tomato, Pickles, Onions. For more details see the BurgerFi $5 Burger announcement. You can also find the deal on the BurgerFi Facebook page. *Offer valid 4/22/2019 only at participating BurgerFi locations. Cannot be combined with any other offer or special. No Substitutions. In-store orders only; offer not valid on in-app, website, phone or delivery orders. For more deals like this including coupons from McDonald,s Wendy’s and Burger King, see the EatDrinkDeals Fast Food Coupons page. The chain has expanded to over 100 locations since its foundation and was one of the fastest-growing fast food chains in the U.S. in 2015. BurgerFi operates in more than 20 US states, in two locations in London, United Kingdom and one location in Panama City, Panama. In 2017, the chain introduced a vegan burger patty called the “Beyond Burger. Made from proteins derived from peas and other plants, the burger has no cholesterol, but it oozes “grease” on the griddle and “bleeds” beet juice, according to a review from The New York Times.